After Home Alone turned into 1990’s biggest hit, a sequel became inevitable. To the surprise of no one, this led to 1992’s Home Alone 2: Lost In New York. Another Christmas brings another holiday trip for the McCallister family, as this time they plan to leave Chicago for sunny Florida. Another holiday vacation brings another trek gone awry, as young Kevin (Macauley Culkin) winds up on the wrong plane, one that sends him to New York City. In a crazy coincidence, Kevin’s opponents last time – “Wet Bandits” Harry (Joe Pesci) and Marv (Daniel Stern) – travel to NYC to stage a major robbery. Once again, Kevin battles against his foes to foil their plans. Looking back 25 years, I remembered that Lost didn’t do well at the box office, but the facts tell me otherwise. Sure, its $173 million fell far short of the original flick’s $285 million, but that was still a strong take for 1992 – enough to make Lost the year’s second-biggest hit after Disney’s Aladdin. It’s unclear why Home Alone 3 didn’t materialize until 1997, and that one offered a true bomb, as it mustered a weak $30 million. It also lacked any of the first two films’ cast, though apparently it featured a young Scarlett Johansson in a small part. People may have paid to see Lost, but I find it hard to believe audiences embraced it. Completely devoid of originality and wit, the movie offers nothing more than a warmed-over rehash of the original. To be sure, the first film left – and still leaves – me cold, but it feels like comedic genius compared to the inane Lost. Part of the problem stems from all the inherent idiocy involved, as the sequel stretches credulity past the breaking point. Granted, the first movie required a large suspension of disbelief to succeed, but it becomes even more difficult to swallow that the same abandonment concept could occur to the same kid twice in two years! Those involved must have realized how ludicrous the basic premise was, but they show no sign of self-awareness - Lost plays its events without the wink it needs. The movie really does abound with stupid coincidences required to pull off the plot. The Bandits just happen to pick the same town in which Kevin accidentally arrives? And they manage to bump into him despite the millions of people who reside in that city? At the airport, Kevin winds up on the wrong plane because he chases a guy he believes to be his dad – a man with the same build, coat, scarf and hair at his father, who also happens to be tearing through the terminal at the same time. Oy, my head hurts as I think about the absurdity. Given the broader canvass of NYC in the sequel vs. Kevin’s house in the original, one might think Lost could muster extra creativity there, but it doesn’t. Again, it chooses to follow the same paths as the first film, with similar characters and motifs. Yeah, I recognize that the situation at the hotel offers a minor shift from the original, but that feels like windowdressing. This area fails to steer the film in creative new directions, so it ends up as more contrived tedium. The running time of Lost doesn’t help. Sure, the original went a little long at 103 minutes, but it required some of that space to build the characters and scenarios, issues that don’t need to be part of Lost. Nonetheless, the second film hits two hours on the nose, or 17 minutes longer than its predecessor. This becomes wasted time. A comedy like this should probably clock in around 95 minutes – as noted, the first film got away with a few extra minutes because of its expository needs, but those don’t occur here. That means Lost’s 120 minutes suffer from ample amounts of pure cinematic flab, with large stretches of film that don’t need to exist. None of the actors flesh out their roles well. The leads added some charm to the original, but here they seem to just want to cash their paychecks. They all reenact their roles in a perfunctory manner that lacks involvement and effort. All that and a now-cringe-inducing cameo from Donald Trump! Most sequels exist mainly to make money, but the better ones at least try to stand on their own. Instead, Home Alone 2 feels content to provide a nearly literal remake of the original, one without any charm, wit or creativity. It’s a total waste of time. Home Alone 2: Lost In New York appears in an aspect ratio of approximately 1.85:1 on this Blu-ray Disc. The film came with a decidedly mediocre transfer. Sharpness mostly worked well, as the majority of the film demonstrated fairly good delineation. However, edge haloes cropped up throughout the film, and those gave the image an awkward tentative look, especially in wider shots. This also meant a dearth of fine detail. No issues with jaggies occurred, but some mild shimmering stemmed from airport monitors. Grain tended to be heavy, and I saw a handful of small specks as well. Lost went with a warm palette that seemed overcranked here. The colors leaned too red, a factor that impacted skin tones especially. The hues weren’t bad, but they seemed too heavy. Blacks were dark and dense, while shadows seemed fine, as low-light shots offered reasonable smoothness. Lost could use an upgrade from this lackluster presentation. Though better, the film’s DTS-HD MA 5.1 soundtrack left me fairly unimpressed. The soundscape tended toward music and general environmental material, as it didn’t come with a lot of action to enliven the spectrum. Thunderstorms broadened in a reasonable manner, though, and airport shots added to zing to the proceedings. Nonetheless, the soundfield usually seemed ordinary. Audio quality seemed acceptable but also erratic, and music varied dependent on the source. John Williams’ score offered pretty good range and heft, but occasional rock/pop songs tended to sound thin and mushy. Speech appeared fairly natural and concise, and effects demonstrated fairly positive accuracy. This ended up as a passable but unmemorable soundtrack. 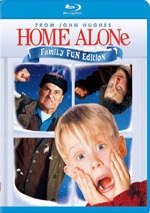 The Blu-ray skimps on extras, as it includes trailers for the first three Home Alone movies and nothing else. While the first film wasn’t very funny, at least it seemed original. 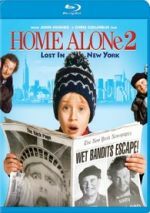 Home Alone 2: Lost in New York suffers from a similar lack of laughs and also falters due to its absence of creative energy. The Blu-ray provides problematic visuals as well as adequate audio and subpar supplements. Neither the movie nor the Blu-ray satisfy.